God answers to some sort of higher moral standard outside of himself, thus he cannot be the basis for our morality. Based on biblical teachings, I do not think the Euthyphro dilemma poses a real problem for the Christian at all. If the statements found in the Bible are even possibly true in what they say about God, then the Euthyphro dilemma is really a false dilemma. So assuming the Bible is correct in what it says about the nature of God, God cannot have other traits then the ones that He possesses, thus there is no arbitrariness. Furthermore, there is no higher moral good than love of the self-sacrificial, agape kind. God’s commands flow from his loving nature, and the New Testament command is to believe in Jesus Christ love as Christ loved. (Jn. 13:34-35, 1 Jn. 3:22-24) There is no love standard that the triune God answers to outside of himself, He is necessarily a perfectly loving being by his very own nature. Moreover, we read that whether we know God or not, He has “hard-wired” all humanity to recognize his commands. The commands aren’t imposed on us from the outside, but rather we recognize internally that we ought to love our neighbor as ourselves. If we do love our neighbor as ourselves, then we won’t steal from them, sleep with their wife, kick their cat, throw fireworks at their dog, etc. The Christian has a special advantage. Not only does the Christian experience the benefit of having their sins forgiven, but they also God’s very own Spirit living within her, enabling her with divine grace to keep God’s commands. To close, if the Christian theology and anthropology is correct, then Euthyphro dilemma really is not a dilemma at all. 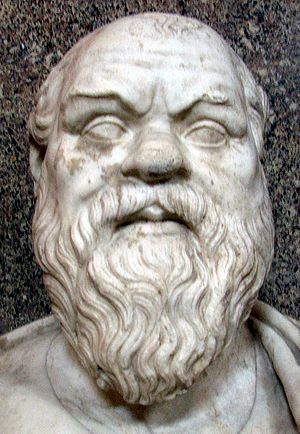 Socrates may have stuck a pebble in Euthyphro’s shoe (or sandal, I should say) but for the Christian believer, there is no quandary. This entry was posted in the moral argument and tagged Christianity, divine command theory, Ethics, Euthyphro Dilemma, Fruit of the Holy Spirit, God, Morality by Erik Manning. Bookmark the permalink. Wow, Erik! I really love this post. I really like how you used the Bible to show how the portrayal of God is antithetical to the Euthyphro dilemma. This is something I’ve personally made note of: the dilemma has a different view of “god” which comes from its background in Greek thought, in which gods could be good or bad. That is contrary to what Christianity says about God, so the dilemma is very forced when someone attempts to utilize it against Christianity. Another most excellent post here! Pingback: Really Recommended Posts 7/11 « J.W. Wartick -"Always Have a Reason"